After two and a half years the research project ‘Design and Testing of Innovative Freight Cars’ (Aufbau und Erprobung von innovative Güterwagen) has successfully finished. During that time these freight cars also spent twelve months in operation, covering 150,000km all across Europe. The working group comprising DB Cargo AG and VTG presented the results during the concluding meeting in the Federal Ministry for Transport and Digital Infrastructure (BMVI) on 11 April. The results were positive: the freight cars used 2–3 percent less energy. In addition they were more economical since they optimised operations as a result of customer-focused changes and new digital modules. DB Cargo AG and VTG will continue to work together to develop multi-functional freight cars with a modular bogie structure. The goal is to deploy cars more flexibly, thereby making rail freight traffic more economical. DB Cargo is convinced of these freight cars’ efficacy. It has already ordered 300 of these innovative freight cars. The new automobile transport car and the multi-functional flat car for steel transports (BraCoil) are the rail freight operator’s contribution to modernisation in line with the ‘agenda for a better railway’ (Agenda für eine bessere Bahn). Some benefits: the vehicle carrier, for example, is able to transport larger vehicles than conventional automobile transport cars. It can carry SUVs and at 33m in length has just four axles. The VTG also says the project has been a great success. It is a project that highlights the potential of rail freight traffic. The Innovative Rail Freight Car project began in 2016. Test operations then commenced in March 2018. The German transport ministry contributed to the project with approximately 18 million euros. DB Cargo and VTG covered all of the acquisition costs themselves, which amounted to around 4.5 million euros. The automobile transport car and the BraCoil will be on display at DB Cargo AG’s outdoor display at the Transport Logistic Messe in Munich, 4–7 June 2019. The innovative tank car, meanwhile, will form part of VTG’s outdoor display. In response to national requirements in the fields of noise, energy, climate, the environment and investments, Germany must take steps in the rail sector. 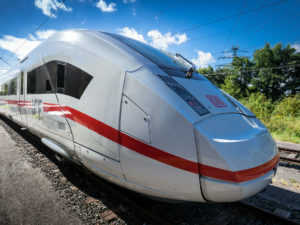 Following an investigation into the issue, the Federal Ministry of Transport and Digital Infrastructure then commissioned DB Cargo AG and VTG AG to run a research project entitled ‘Aufbau und Erprobung von Innovativen Güterwagen’, to determine the migration of technologies that would reduce noise and increase energy-efficiency to the rail freight sector. The transport ministry displayed the resulting innovative freight cars at InnoTrans 2018.